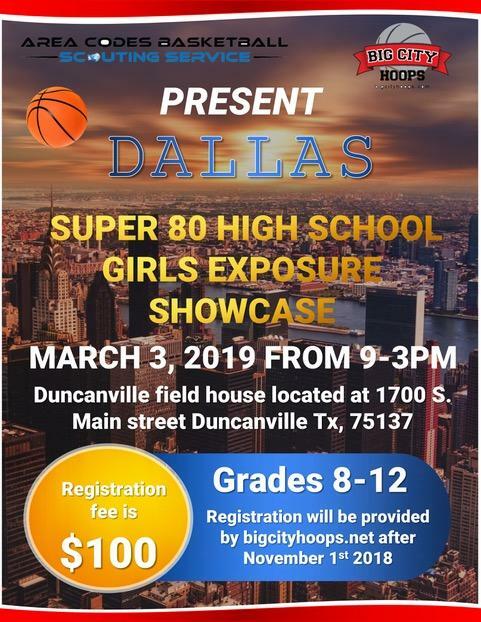 Sign up today for the Big City Hoops Super 80 Exposure showcase. This show case will be at the Duncanville Field house. You don’t want to miss this opportunity to showcase your talent. Spots will be limited! Register today to make sure you won’t miss it. All players can register at bigcityhoops.net. Once your registration is complete we will send you a schedule of events. Contact Bigcityhoops@gmail.com if you have any questions. If you missed the BCH showcase in Arizona you don’t want to miss it when we bring out the talent to Texas. Come out and complete with some of the top talent around the Dallas area extended. Click the link below to register today.